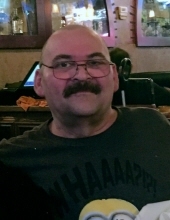 Rickey (Rick) Dale Abbott, 58, passed peacefully from his battle with cancer and gained his angel wings on Monday, Feburary 5, 2019 at his home in Montgomery,Tx. He was predeceased by his Father William Rhodes, his brother Randy Abbott, His Nephew Anthony Barnhart and His Grandmother Flora Mae Martin. He is survived by his Wife Dana Everett, His children Justyn Abbott and Annie James and her husband Robert James, His "adopted" children Nicole Straubel, Brandon lane, Richard Lopez,and Ryan lopez, his grandchildren Bryce, Mackenzie, Brendon, Daysi, Makayla, Gabbie, Autumn, Brandon Jr. and Brayden, his great grandchild Tucker, His Mother Vivian, His sisters Janice, Lisa,Vivian,and Brenda and his Brother William along with many other family members. His favorite Hobbies were writting poems and watching tv from court shows, to game shows, to cooking shows. He had many different jobs throughout his life but the best job he ever had was being a Pawpaw to his Grandchildren. He was known by his close family for his goofy dance moves and his ability to change lyrics to any song he sang. In His later life He was known for his naps, his love for Mexican food and being a fighter as he went through many health issues and still came out of them smiling and dancing. His Viewing will be held at McNutt Funeral Home in Conroe, Texas on Tuesday Feburary 12, 2019 from 2pm till 6 pm followed by a celebration of life potluck dinner at The Magnolia Community Building in Magnolia,Texas from 5pm to 9pm. To send flowers or a remembrance gift to the family of Rickey Dale Abbott, please visit our Tribute Store. "Email Address" would like to share the life celebration of Rickey Dale Abbott. Click on the "link" to go to share a favorite memory or leave a condolence message for the family.